Low-cost, high performance, C/C++ programmable, 16-bit microprocessor core module. It is designed for embedded applications that require compactness, low power consumption, and high reliability. The A-Core is a minimized version of the A-Engine. It reduces the mechanical dimensions, cost and power consumption as compared with the A-Engine. 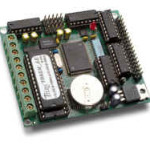 The A-Core is a low-cost, high performance, C/C++ programmable, 16-bit microprocessor core module. It is designed for embedded applications that require compactness, low power consumption, and high reliability. The A-Core is a minimized version of the A-Engine. It reduces the mechanical dimensions, cost and power consumption as compared with the A-Engine. The A-Core can be integrated into an OEM product as a processor core component. It also can be used to build a smart sensor, or as a node in a distributed microprocessor system. By building your product around the A-Core, you reduce the time from design to market introduction, cut development costs, minimize technical risks, and deliver a more reliable product. There are three 16-bit programmable timers/counters and a watchdog timer. Two timers can be used to count or time external events up to 10 MHz. They can also be used to generate non-repetitive or variable-duty-cycle waveforms as PWM outputs. The Pulse Width Demodulation (PWD), a distinctive feature, can be used to measure the width of a signal in both its high and low phases. This has potential in a variety of applications, such as bar-code reading. The A-Core has 32 user-programmable CPU I/O pins, plus 8 additional TTL digital outputs (74HC259) available. The A-Core expects a regulated 5V voltage supply, and does not provide RS232 drivers by default. 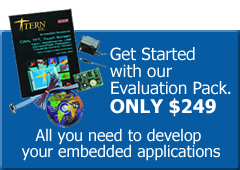 The VE232 or the on-board 5V regulator/RS-232 driver option can be used to provide this. Be sure to also check out the new A-Core-86, which is a 16-bit external bus version of the A-Core. It is a similar controller but with almost double the performance capabilities. If your application utilizes high-voltage I/O, the MiniDrive88 is a controller similar to the A-Core, adding 35 solenoid drivers (supporting 0-30V I/O signals) as well as screw terminals with only slightly larger physical dimensions.